He settled on an old oak door he’d found in the basement. It was heavy and thick. With four straps made from a leather belt bolted in with metal clamps two to a side, and a base made from a couple of sawhorses, it was a solid table on which he would restrain the man. He assembled it quickly but with attention; this was the most important part of the plan. If the table failed, the plan would fail. After pounding the final nail, he climbed onto what he had made and laid back. He thrashed around a bit and found it to be sturdy. 238 days. That’s what they took – 238 days of his life, gone. At first, he figured it must be a mistake. He’d been in American jails before. Each time the officers talked tough, and most of the time he served a few days or, twice, was sent back. After the second day turned to night and he still hadn’t seen or heard anyone, he realized this was different. If that hadn’t tipped him off, the dank canvas hood placed on his head before he was driven for what seemed like several hours and then flown somewhere, certainly did. The room was special, secure, with a door like that of a safe. Everything seemed to be controlled by a panel inside the door. There wasn’t much in the way of furniture, just a couple of chairs, a couch and a small table. Canned food and gallon jugs of water lined one wall. He wasn’t sure if there would be enough, so he rolled two barrels in from the back yard that were used to burn yard waste, ran a hose in from outside and filled them to the top. The swirling water dislodged flakes of rust that spun lazily on the surface. He coiled the hose and erased any trace of his efforts. The real rub? He’s not even Arab. He’s a Mexican, for Christ’s sake, and anyone with an ounce of sense could see that. Now, he was a bad guy, he’d give them that. But his was the kind of bad that got you sent to prison. Drugs. Armed robbery. A carjacking once. He could do that kind of time, had done it. But this, this was something else, and no matter how much he protested that it must be a misunderstanding, they ignored him. If this was a jail, there were no other inmates. There was no time in the yard. On the day, everything was set. He was too full of energy to sit, so he stood just inside the door of the room, a cell phone in his hand. As he had been assured, the car arrived around 5 a.m. He heard the old man before he saw him, his shadow cutting across the morning light that streamed through the open front door, a shine bouncing off his bald head. The man yelled back over his shoulder that he had to use the can and that they should wait outside. There would be two waiting, according to what he had been told. After working on a fishing boat for several months, he’d made the mistake of trying to cross the border from Canada instead of coming up through southern California like all the unlucky pendejos who are just grabbed and sent back. He regretted that decision each of the 238 days. He could have found a way to make ends meet in Canada; but the lure beyond the border was too great. The man who offered him a ride and forged papers was using him to get through a roadblock, figuring an Arab and a Mexican wouldn’t look so suspicious. He was wrong, which was why they had both been labeled “enemy combatants” and shipped to the island. He took a step back into the shadows of the room and punched a number on his phone. When he heard Carlos answer, he pushed a button and held it for five seconds. He then hung up. This was the diciest part of the plan, but the old man had to need to be in the room if he was to have time to do what he wanted to do. Plus, he knew the man was dangerous with guns around, even when he didn’t mean to be. With the guns outside and the man inside, he liked the odds much better. On the island, they kept him cold and dark and alone, 24 hours a day. And that was the good part. The bad? Being laid out on a board and having water poured on your face until you think that this is the time they’re never going to stop. Being kept naked. Being beaten. Being naked and beaten and left huddled in a corner with other men while snarling dogs snapped at any appendage unlucky enough to stick out of the pile. Alone, he couldn’t have kept track of the days, but together, it was their ritual. Some men had prayers. Some remained silent most of the day. But each man had a different number, and he recited it each day. His count stopped at 238, the day they came without a word and threw someone else’s clothes into his cell. A burly guard grabbed him once he’d changed and pushed him out the door. He was taken to a plane that flew him to Matamoros. The officer who discharged him told him two things: never talk about what had happened, and never try to come back into the U.S. Of course, he did both almost immediately. It was so much easier to get across from here than it had been from Canada. Wall? Fence? It didn't matter. The coyotes were motivated by greed. The old man needed help getting up onto the board, but soon Jesus had him on his back and strapped in. He removed the man’s glasses, dropped them to the floor and crushed them under his boot. “Let’s talk about enhanced interrogation techniques,” he said, going over to one of the rusty barrels. He grabbed a two gallon bucket from the floor and dipped it in to fill it. He walked back to the old man and hit him hard in the mouth. “Tell me, do you know where Osama bin Laden is?” he said as he poured the water over the man’s face, causing him to sputter and choke. He’d worked his way around Texas, doing odd jobs here and there. He told his story to some fellow workers over a beer after a day of repairing fence on a ranch. “Hey, one of those old dudes that used to be in Washington has a place around here,” one said. “He stops by on hunting trips. Not the dumb one. You know,” he said, sneering with a growl. “That guy. We do work there sometimes.” A day later, while watching as his friend, Carlos, used a remote control to steer a small plane through the sky, Jesus had an idea. He had been told that it would take even the old man’s guards at least four hours to break into the room once they realized something was wrong. There was no override for fear they could be tortured into revealing the code. Jesus found that funny. The torture was going to happen inside the room, not outside it. All he wanted was 238 minutes. He hoped the old man’s heart would hold out. It wasn’t a fair trade, but he was going to do everything he could to make each of those minutes feel like a day of hell. BIO: John Kenyon is a newspaper editor in Iowa who writes the blog Things I’d Rather Be Doing (tirbd.com). 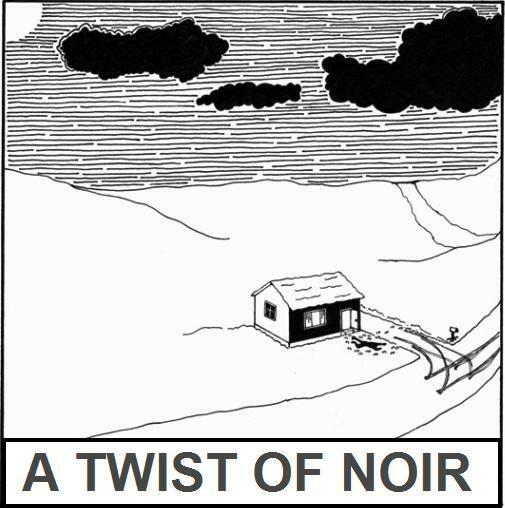 He has published short fiction in Thuglit, Crime Factory, Beat to a Pulp and elsewhere. I like the leading off with the table a lot. It's the precursor of what gets turned later on. John's dispassionate, reporter-clear viewpoint doesn't allow for right or wrong, moral or immoral or any of the other judgment points we all make every day. Just the facts, the bright, cruel, sharply honed points of reality that bring us finally to a harsh justice. Fitting, but unsettling. Great ride. Cool. Unsettling, like AJ said. Wish this could happen for real.